June 26th, 2013 – (Wilmington, DE). Islamic Jihadist attacked a convoy of Indian military personnel who were returning after spending vacation with their family and friends. 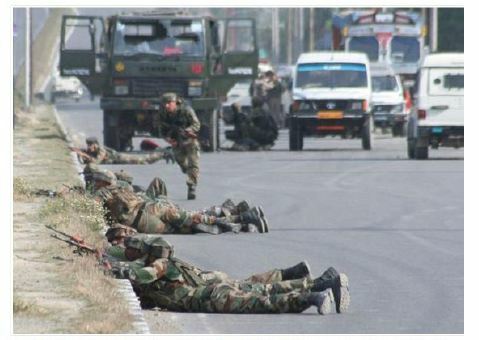 These young brave soldiers were un-armed when Islamic Jihadist came on motorcycle and started indis-criminate firing. This heinous culture of Islamic Jehad is deplorable and in fact during this phase Indian military was busy in providing relief to Uttarakhand and increasing security for Maa Vaishndevi Yatra. The attack proves again that Islamic Jihadist follow no rule, no ethics and act in gravest uncivilized manner once they get an oppor-tunity. HMSA request Indian defense ministry to extend AFSPA to entry points of transit areas and equip military personnel’s with arms as they enter transit points leading to such war zone areas to enable appropriate retaliation.